U.S. Geology Maps Reveal Areas Vulnerable To Man-Made Quakes : The Two-Way Parts of Oklahoma and Texas have about the same risk of an earthquake as parts of California, the maps show. Why? Wastewater that oil and gas operations are pumping into wells adds pressure on faults. USGS scientists have now published the first maps of these new quake zones, and they're an eye-opener. An eye-opener because 7 million people are now, suddenly, living in quake zones. There are 21 hot spots where the quakes are concentrated; they're in places where, historically, noticeable earthquakes were rare: Texas, Colorado, Arkansas, Kansas, New Mexico and Oklahoma. 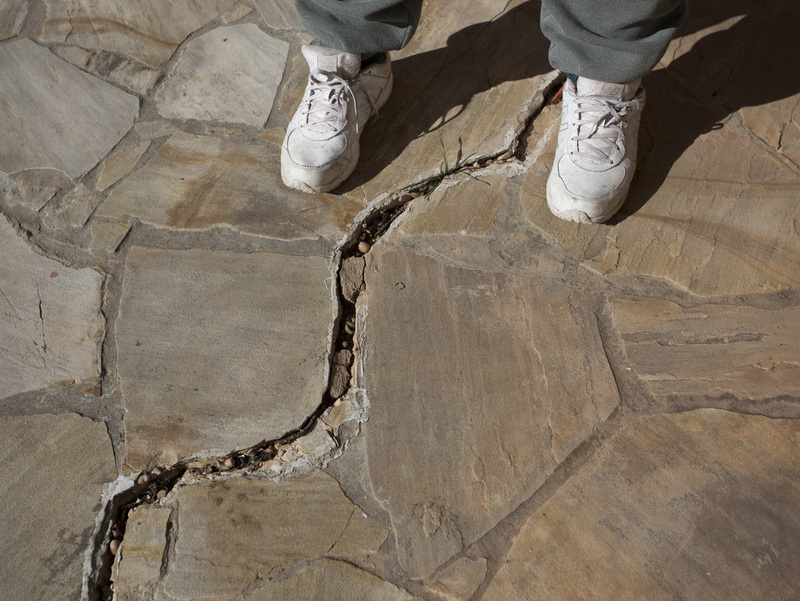 Ohio and Alabama have also experienced some induced quakes. 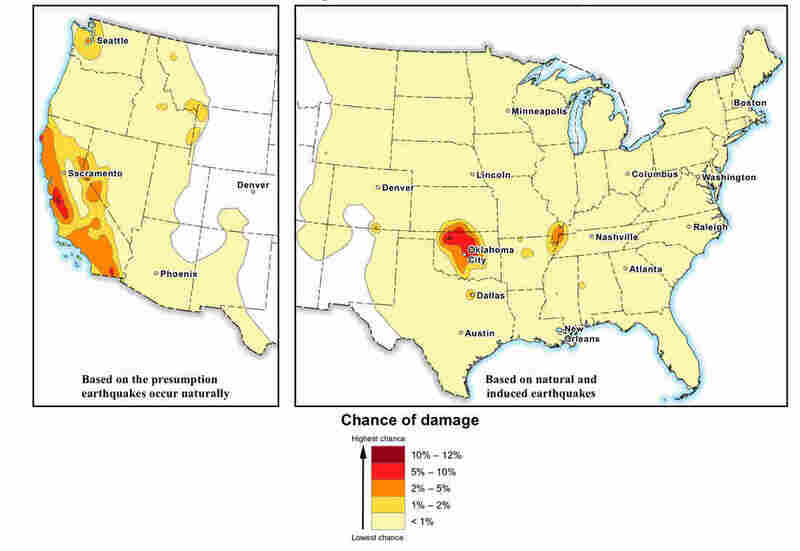 This USGS map displays potential to experience damage from natural or human-induced earthquakes in 2016. Chances range from less than 1 percent to 12 percent. Petersen says induced quakes have become more frequent because there's more wastewater from oil and gas operations around the country that has to be disposed of. Companies pump it down into underground wells, and sometimes that water raises pressure on underground faults that then slip and cause small quakes. The new maps also include the risks of natural quakes around the country, as they have in the past. Those risks haven't changed much. But the number of induced quakes has increased tenfold since 2014, according to the USGS. A USGS map shows 21 areas where scientists have observed rapid changes in seismicity that have been associated with wastewater injection. 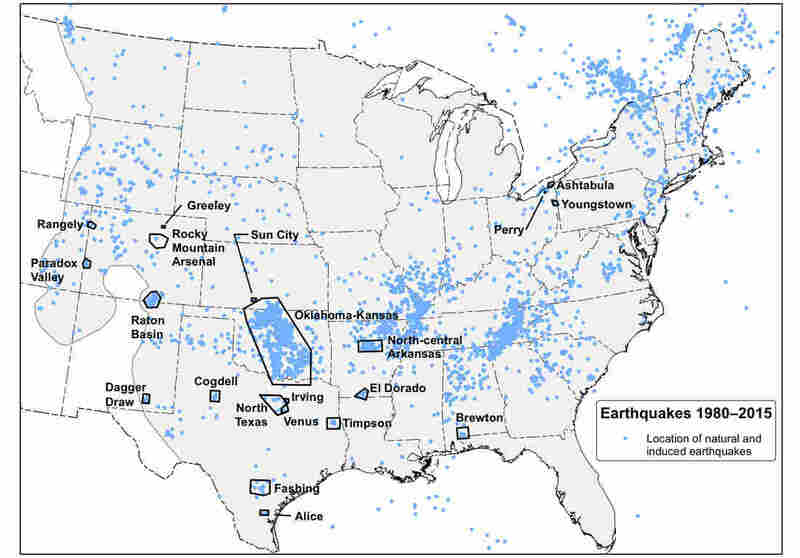 The map also shows earthquakes — both natural and induced — recorded from 1980 to 2015 in the central and eastern U.S. with a magnitude greater than or equal to 2.5. Mark Zoback, a geophysicist at Stanford University who studies induced quakes, says: "It's important to recognize the risk that these maps point out, but that risk is going to change depending on what's happening on the ground." Wastewater wells may not be active for more than a few months or a year; after that, they may no longer pose a risk. Meanwhile, it can take years for a state or community to change building codes to make structures more quake-sturdy. Justin Rubinstein of the USGS says many companies do share information about their wells, but it's spotty and varies from state to state. "You can get data [from industry] a year, a year and a half after what was going on, and if you are a regulator interested in understanding what's going on, that means a year or a year and a half lag." He says geologists want to examine areas where wells might be drilled, to look for faults that might make them vulnerable to quakes, but scientists don't usually know where those future wells will be in time to do the research. "The USGS doesn't make policy," Petersen says. The best the agency can do, he says, is pinpoint the hazards so policymakers can decide what to do.